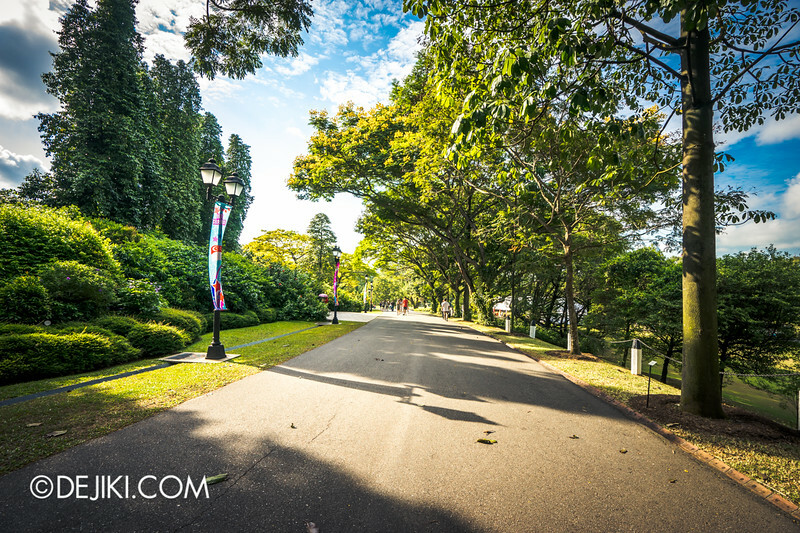 The official residence and office of the President of Singapore, The Istana, is open for a handful of times every year. 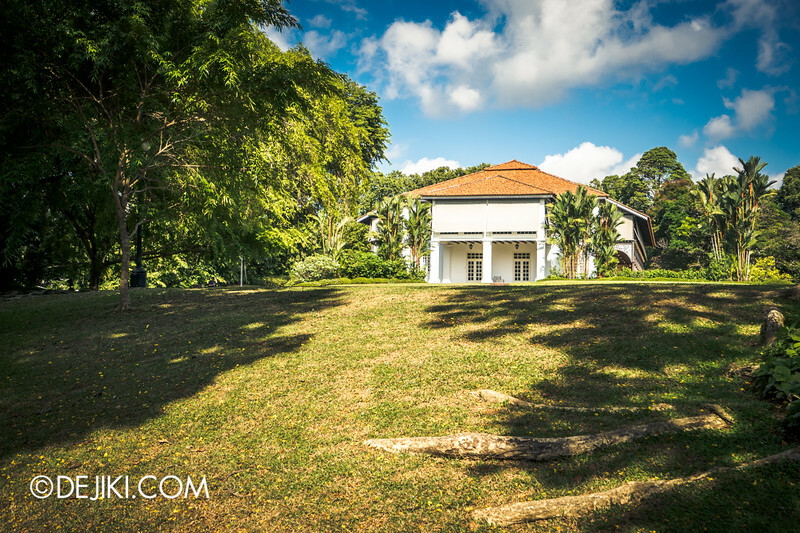 Located at Orchard Road, the extensive compound is filled with gardens and historic buildings completed in the 1800s. 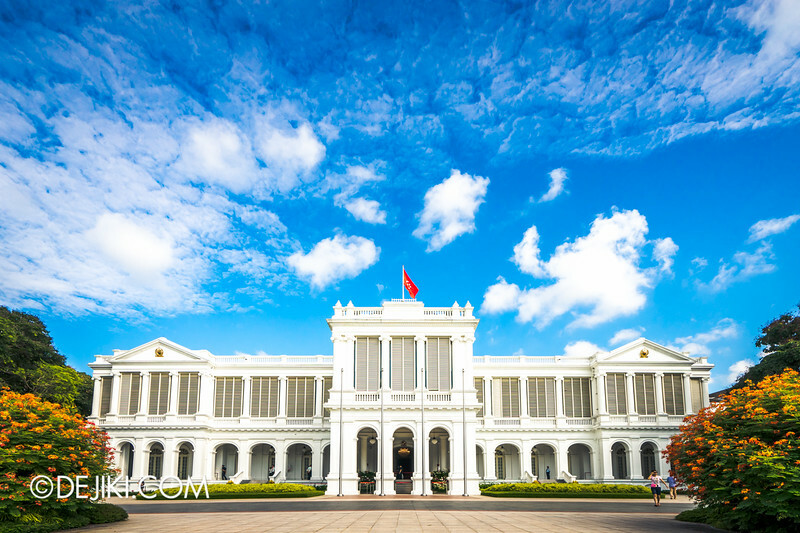 The Istana (‘Palace’ in Malay) is open to the public in celebration of local holidays, such as Chinese New Year, Deepavali, Hari Raya Puasa, Labour Day and National Day. 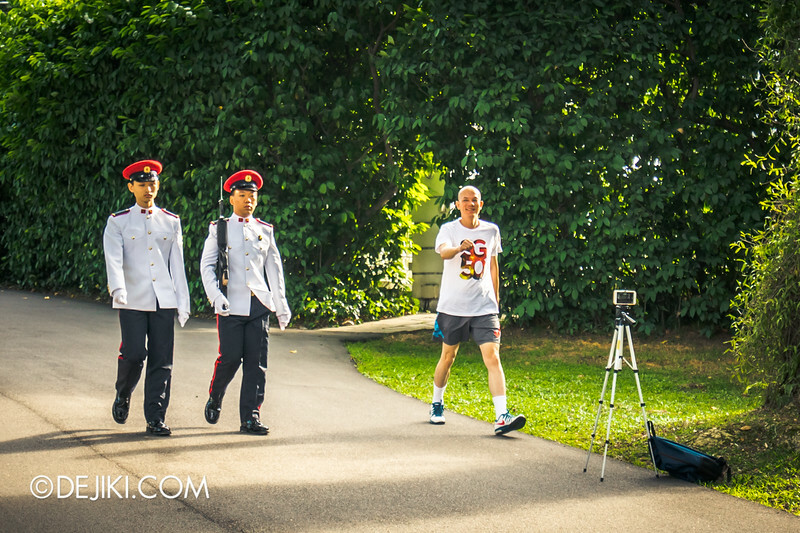 Occasionally, it is also open during special events, such as the SAF50 @ Istana that took place recently. And then I woke up at 7AM that Sunday. 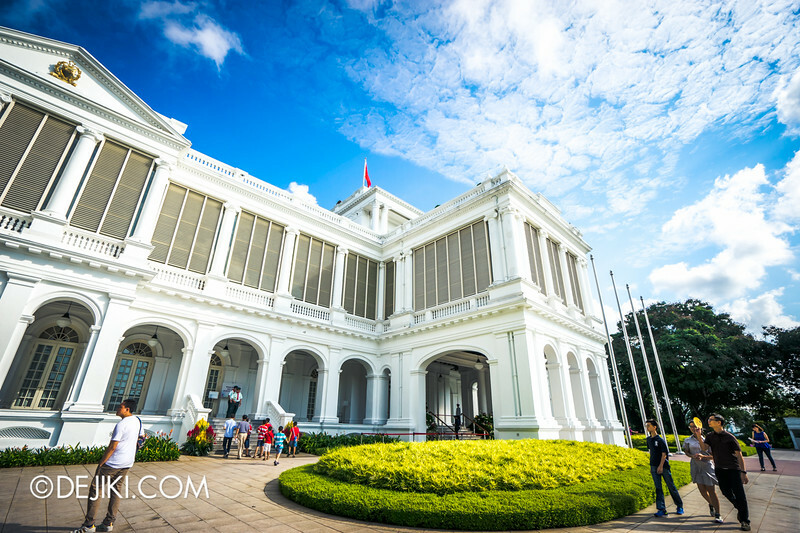 During these Istana Open House events, local residents (Singapore Citizens and Permanent Residents) may enter the grounds for free, while other visitors can buy an entrance ticket for $2. 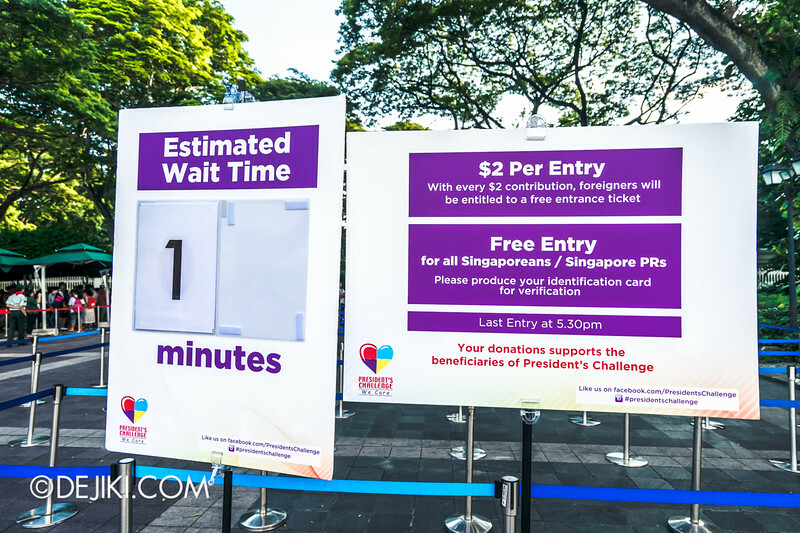 There are three lines: Two queues on either side of the gates are the same for all visitors, according to a Scout (don’t know if he’s forced to be here for Community Involvement Programme, he looked so bored..). The centre lane is the priority queue (e.g. for visitors in wheelchairs). 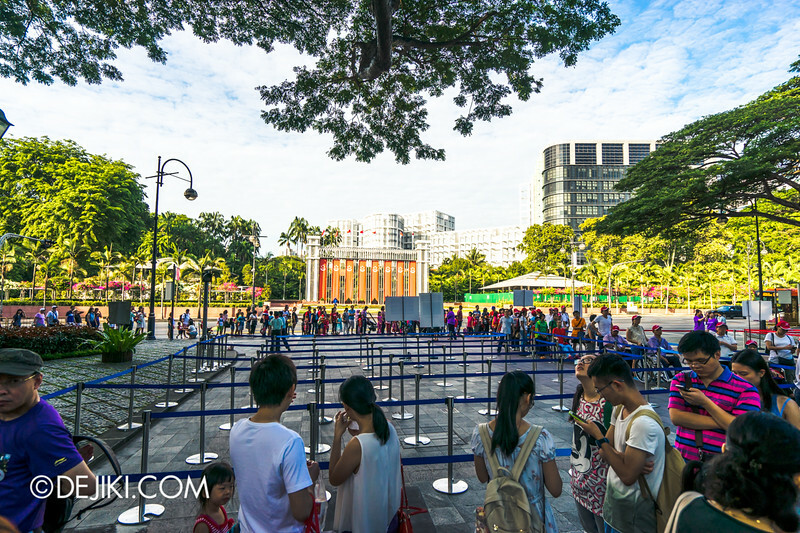 We thought that it’ll be packed since it’s SG50 craze and all, but surprise surprise – even at 8:20AM, there were just a hundred or so people in front of us. They didn’t let people in until 8:40AM. 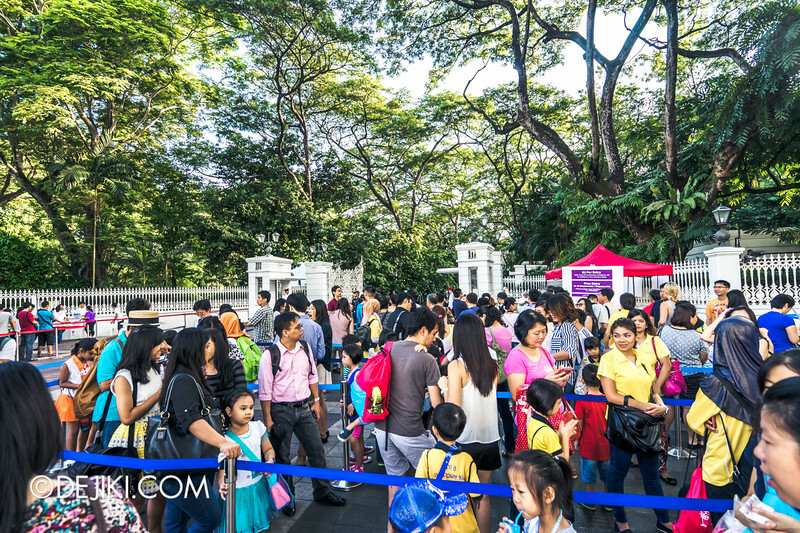 Entrance ID checks and the security scans were the bottlenecks. We got in at around 9:00AM. 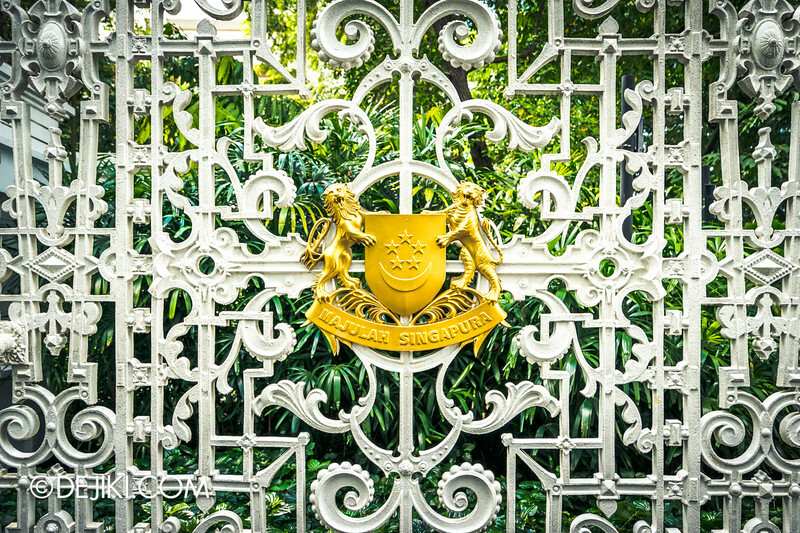 Golden State Crest on the Istana’s Main Gates. 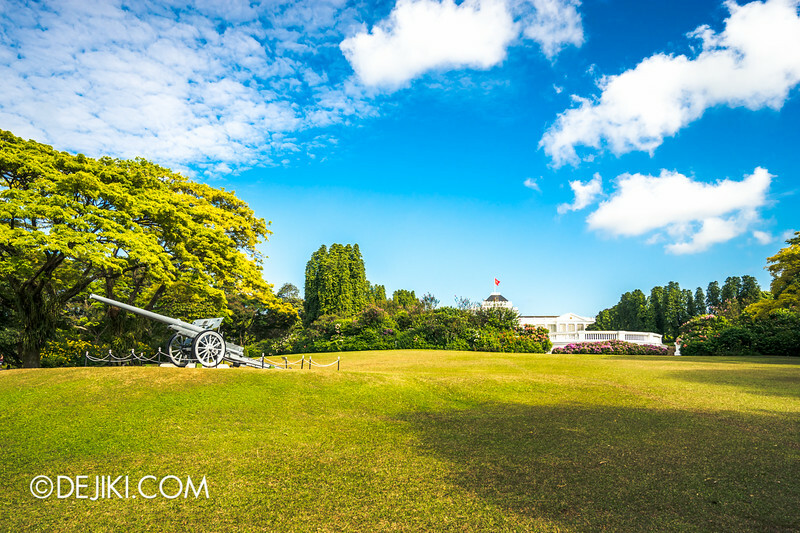 It’s so much bigger on the inside – when was the last time I’ve been in such a place? 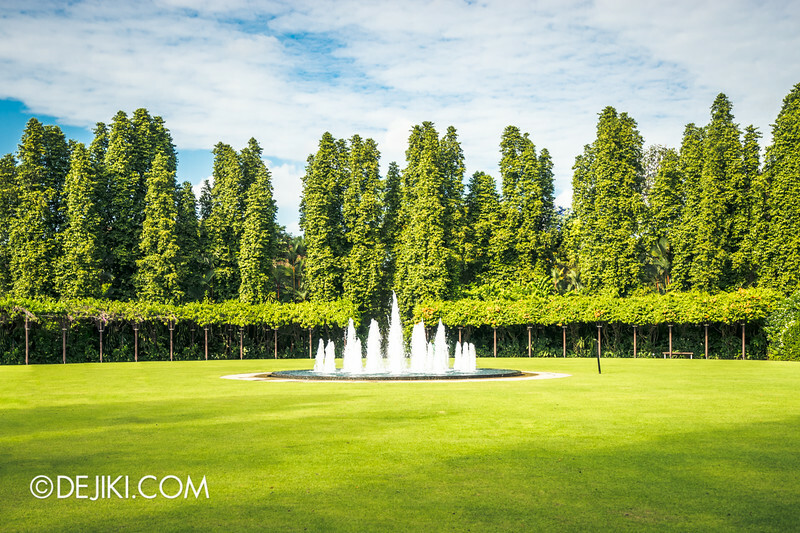 The last garden I stepped in was Gardens by the Bay’s Flower Dome. 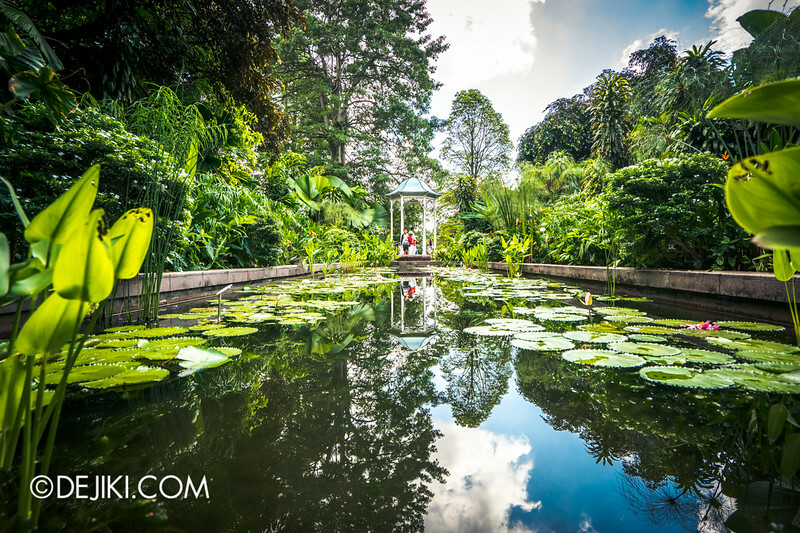 A visit and photo tour of the Botanic Gardens is in order. It’s a huge open field. 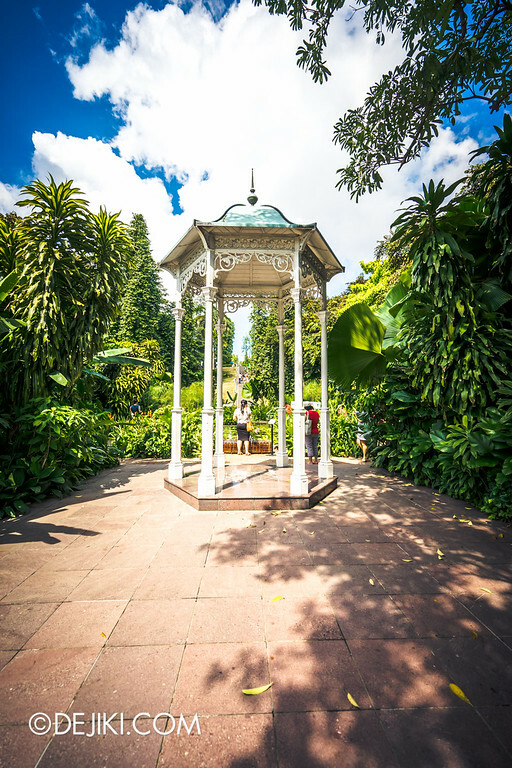 Resist the urge to steal the buggies. 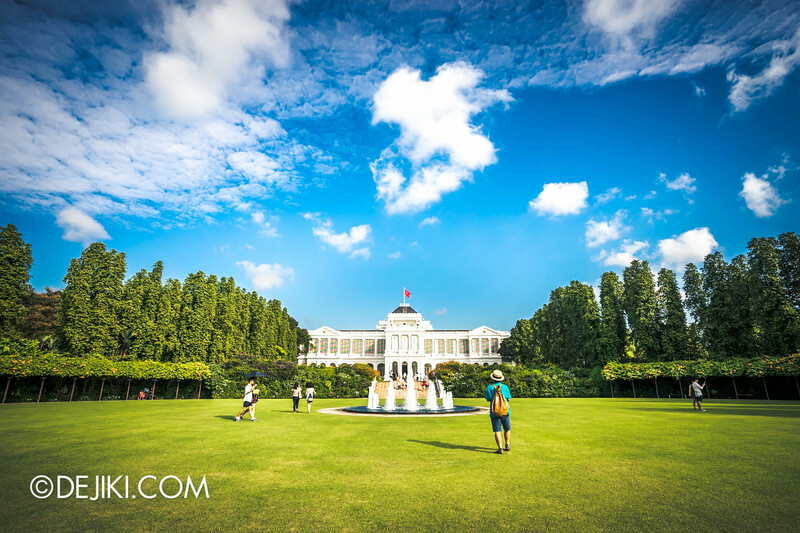 Or take awkward photos with the Istana Ceremonial Gardens. Some things looked very out of place. 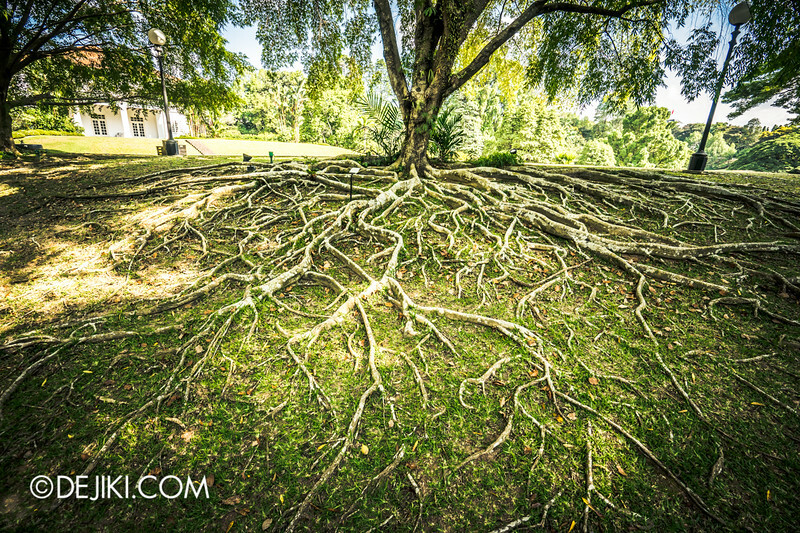 Yes, everything’s to the right – we know. Are these signs of any historic value? 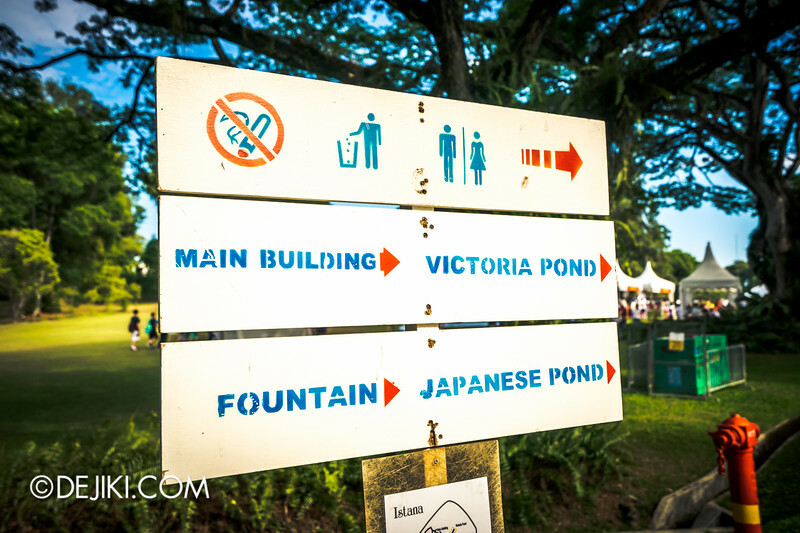 I’ll offer to re-design all the signage at the Istana, pro-bono. Just reach out to me. 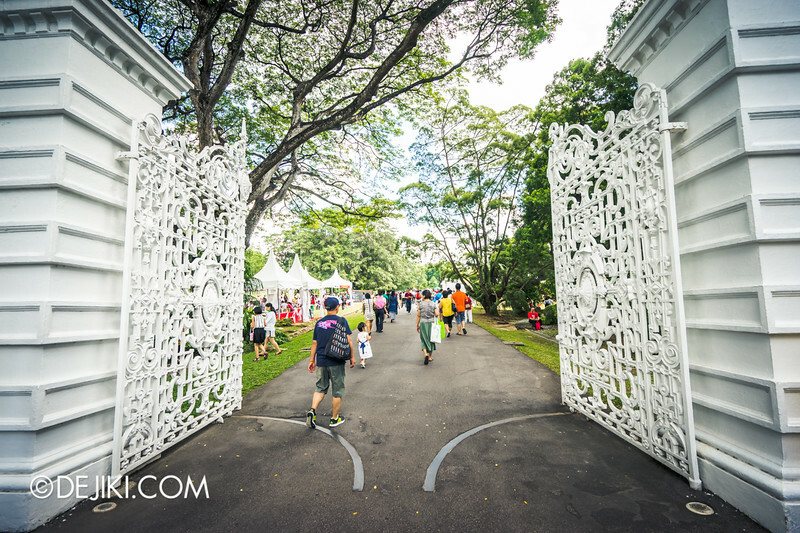 The one of the first ‘attractions’ inside the Istana – the Centre Gates. 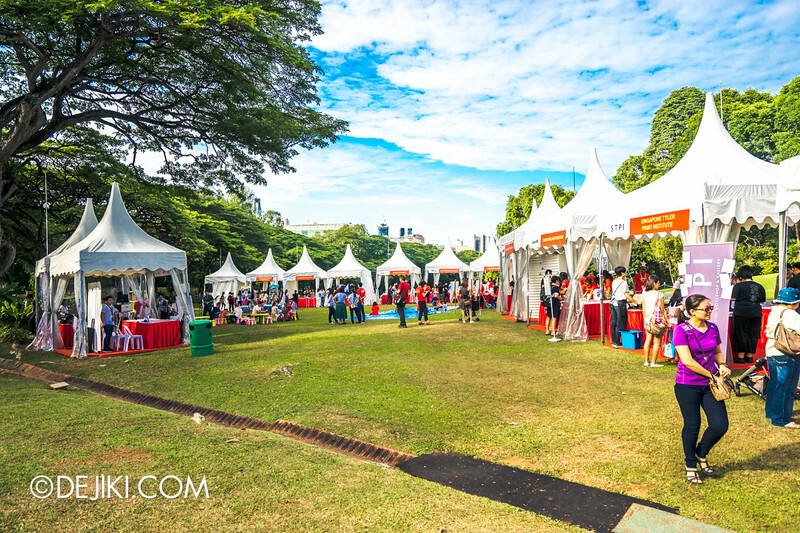 Tents are set up here for special events, such as the Istana Art Event held on 2nd August 2015. 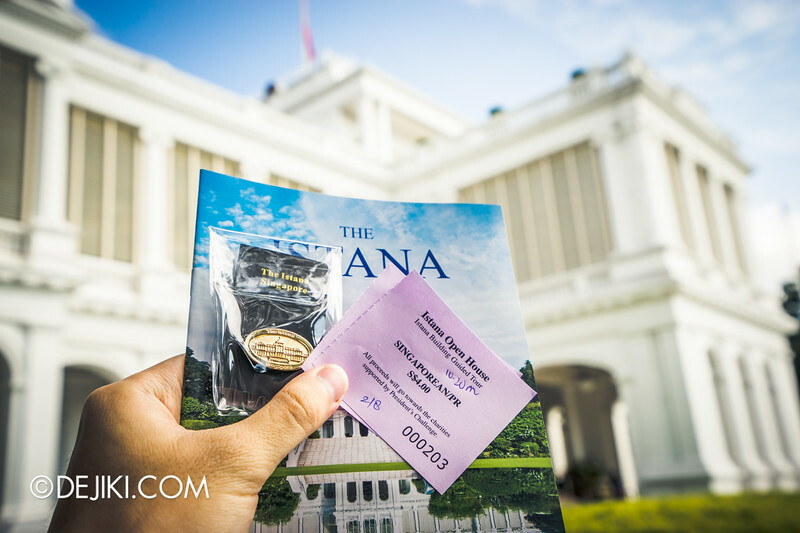 You can also buy Istana-branded souvenirs here. Proceeds go to the President’s Star Charity. 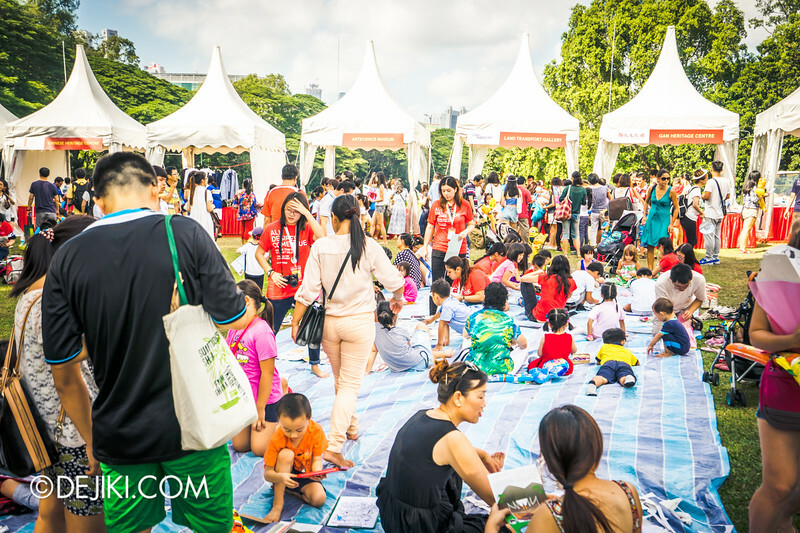 As part of the Istana Art Event, many museums set up special activities and giveaways here. 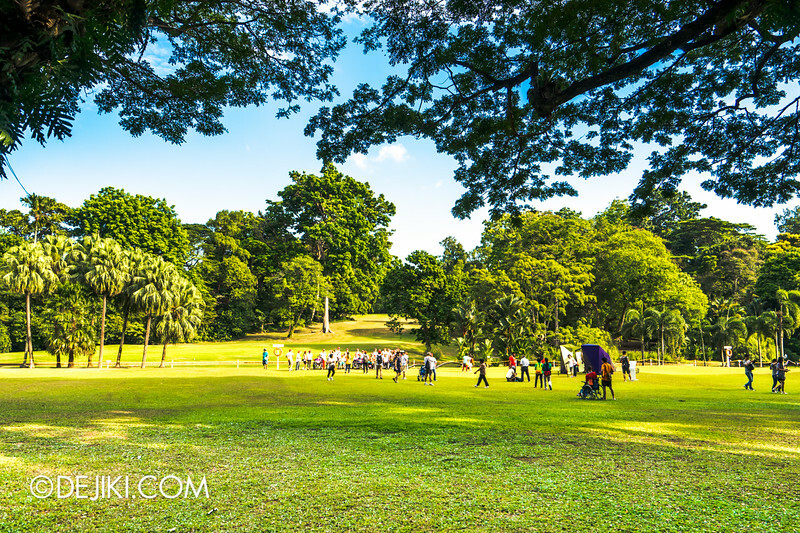 After walking past a field, comes the bigger field – with one patch of golf green that’s fenced off. Anyway doesn’t this remind you of the ol’ classic Windows XP wallpaper? 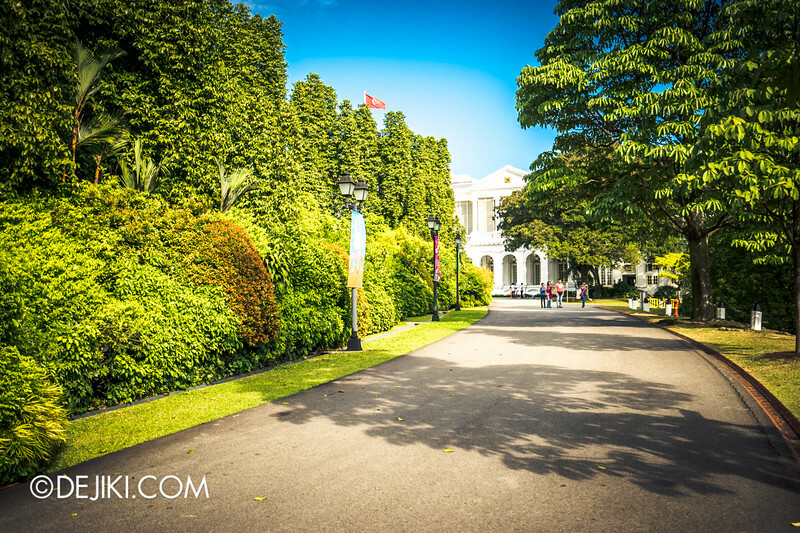 It’s hard to see outside of the Istana – almost like Disneyland. Speaking of which, there’s enough land here to build a small Disneyland – but we’ll probably see pitchforks before the idea gets pitched. 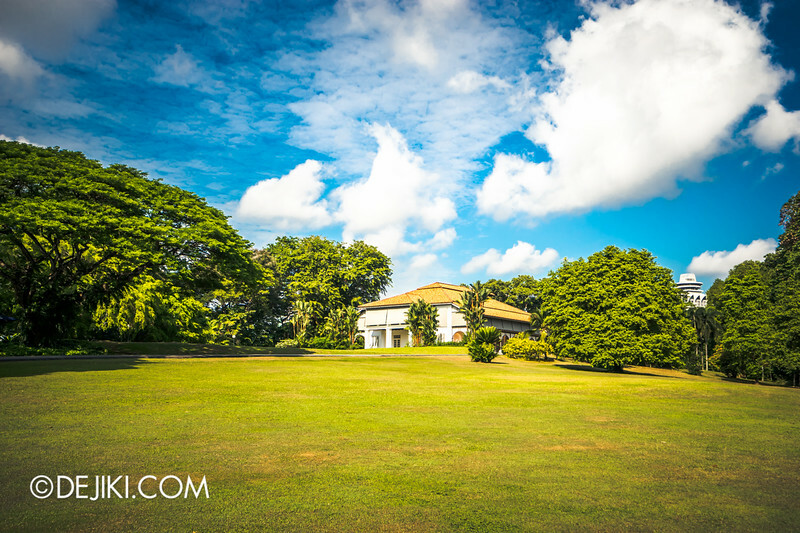 We walked across the field and went towards the Villa. I was surprised to see this installation, because there’s a similar piece near my workplace. 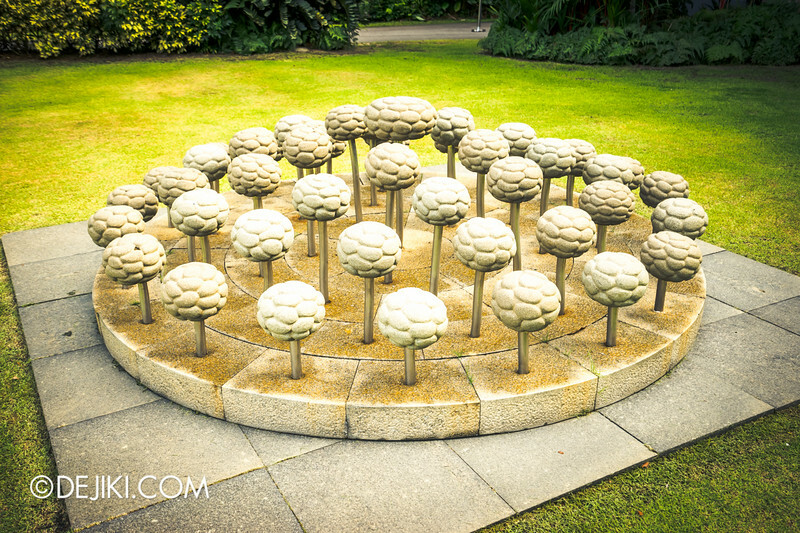 If you know who created this sculpture, do post a comment! 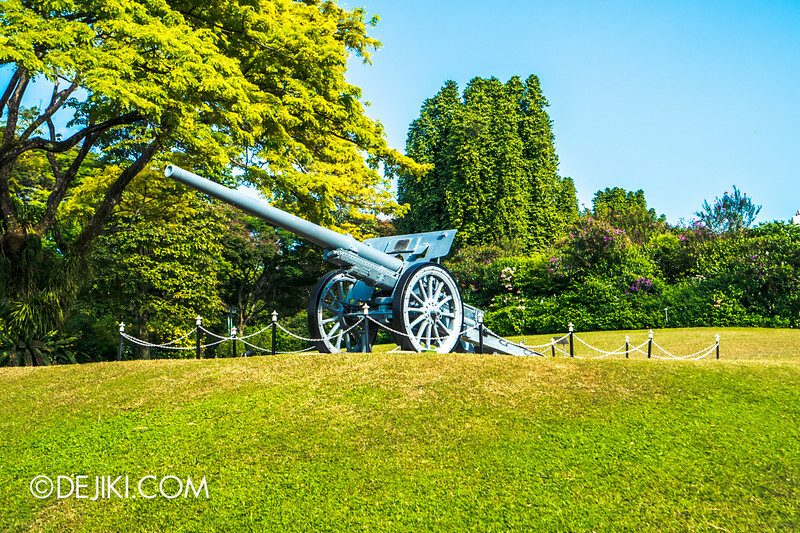 A 105mm Japanese cannon rests at the Gun Terrace, a symbol of the liberation of Singapore after the Japanese Occupation. 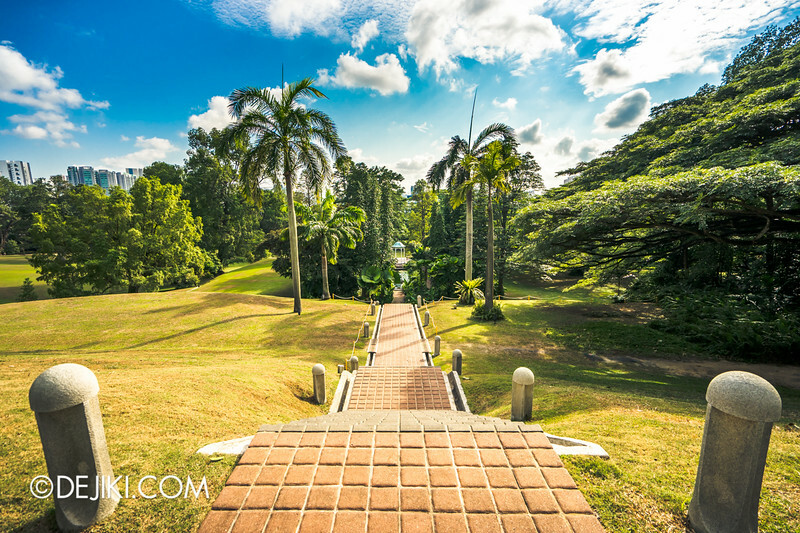 The main building is nearby, but we saw a path leading down to the Victoria Pond. The Statue of Queen Victoria is missing. 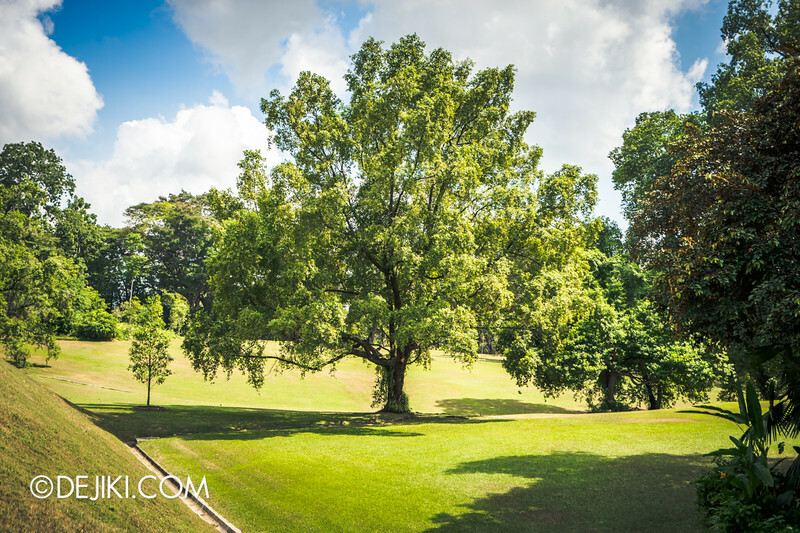 Is this the #InstagramTree of Istana? Unfortunately we weren’t allowed to explore that area. 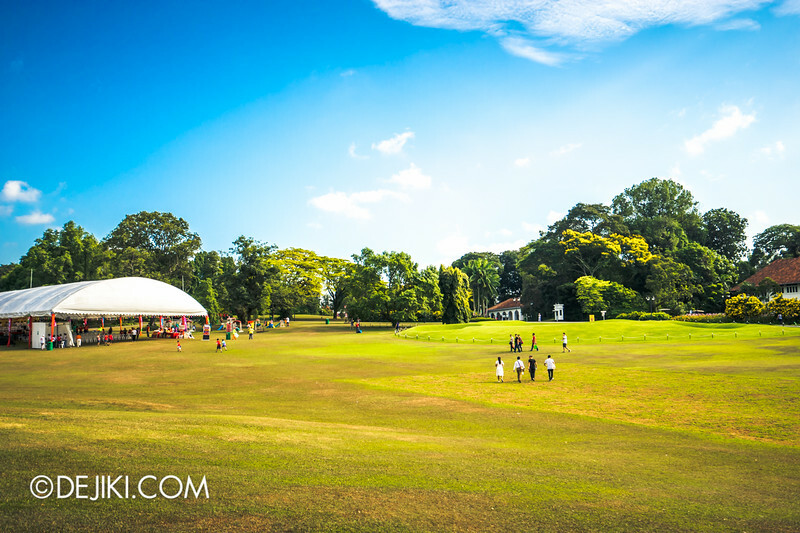 Many paths lead to the main building, but the most iconic one is through The Lawn. 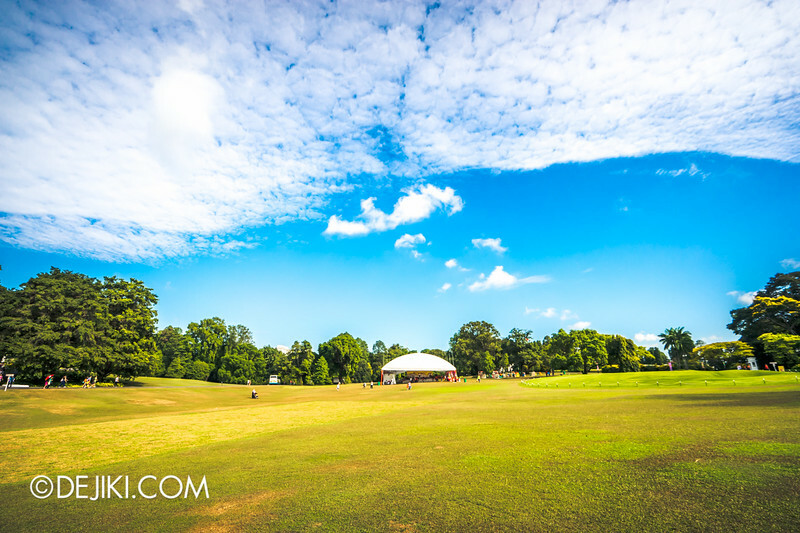 This is where you’ll want to go if you decide to be at the Gates early. Come here first, take your photos before it gets crazy crowded with people. Yep, this is the kind of empty I want. Beautiful, isn’t it. 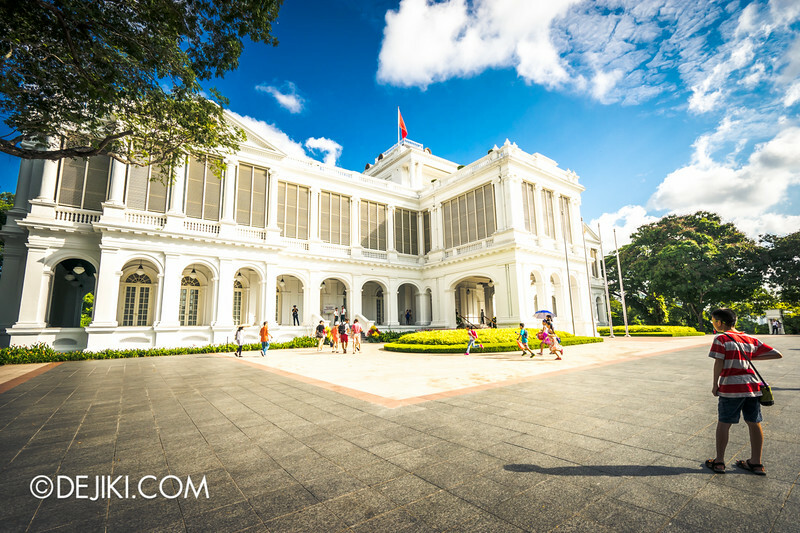 There is a charge to enter the Istana building, and of course, you won’t be able to explore the whole place. For $2, you get to access select areas of the first floor. Guided tours are also available (which we accidentally bought, forgetting that the self-tour option was available) for $4. These rates are for local residents. 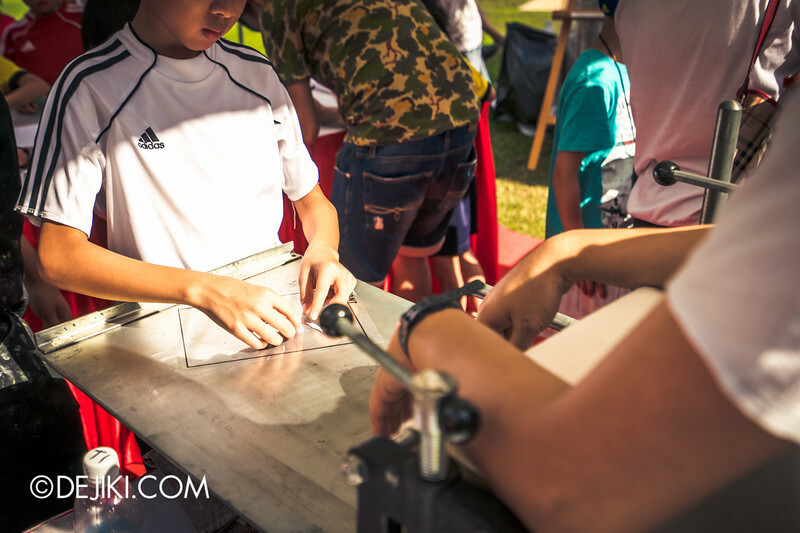 Other visitors will need to pay $4 for a self-guided tour and $10 for the guided tour. 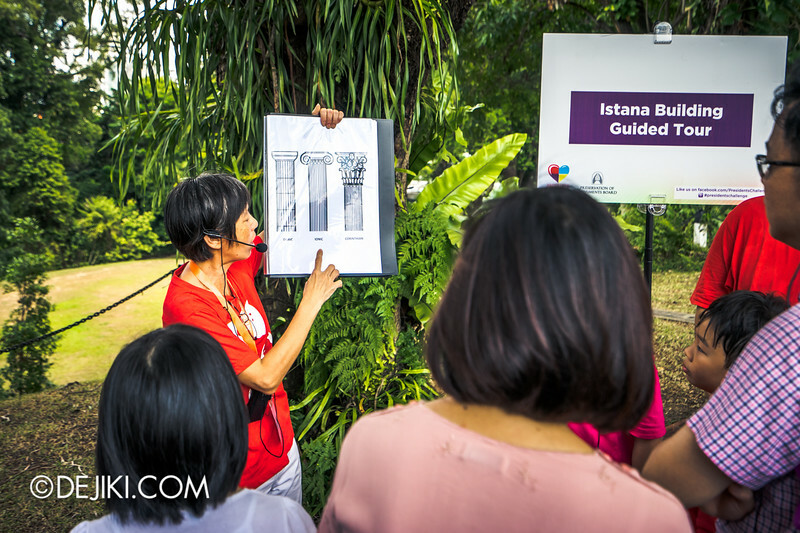 The guided tour can get as long as an hour. 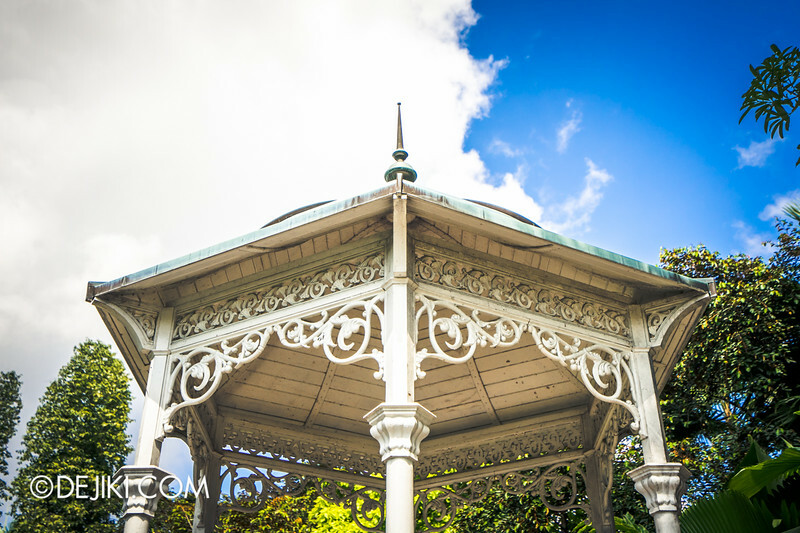 You’ll learn about column capitals. We spent 10 minutes outside admiring the exterior of the Main Building. 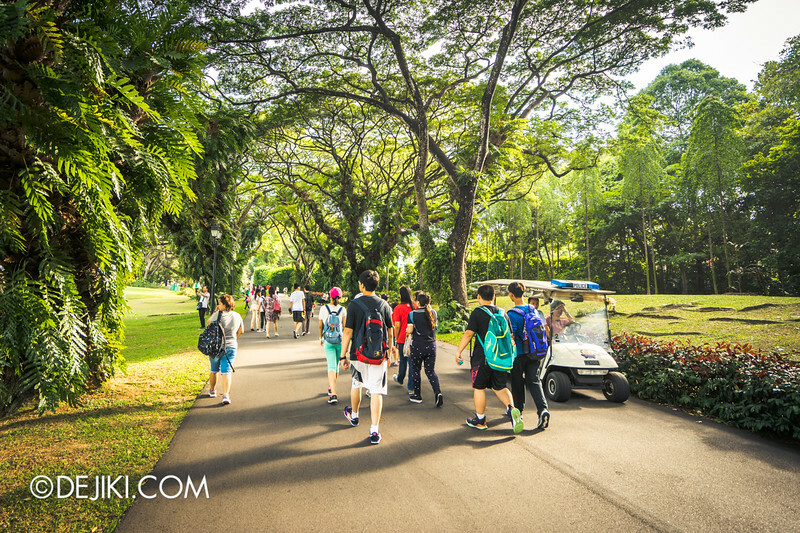 Whether the guided tour is worth it or not largely depends on what experience you’re after. As much as I’d like to be nice, there really isn’t much to see inside ($2 donation to get in after all, and a bit more for the guide) that a typical walk might take… 10-15 minutes? Also, many of the state gifts were sloppily displayed in the banquet hall. First time I’ve ever seen frayed, wrinkled and odd strips of cloth being used to do table scallop and skirting. 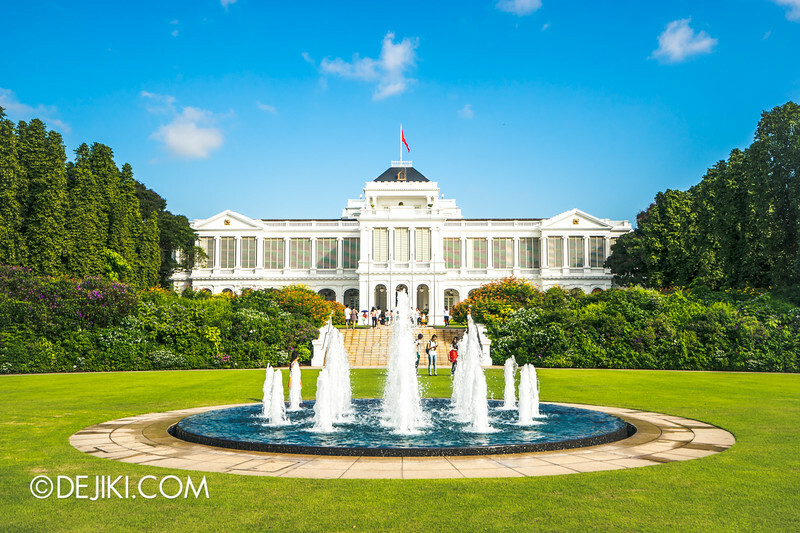 The last place to see is Sri Temasek, which is officially known as the residence of the Prime Minister, although it is used for official state functions. 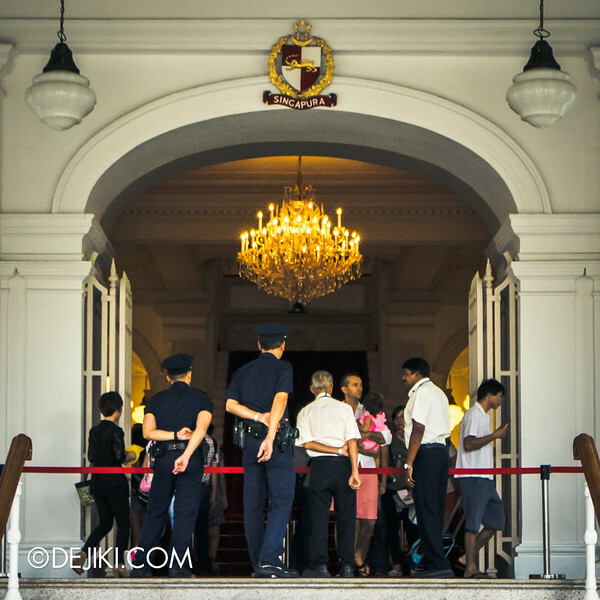 Earlier this year, it was used to hold the private wake for Mr Lee Kuan Yew. 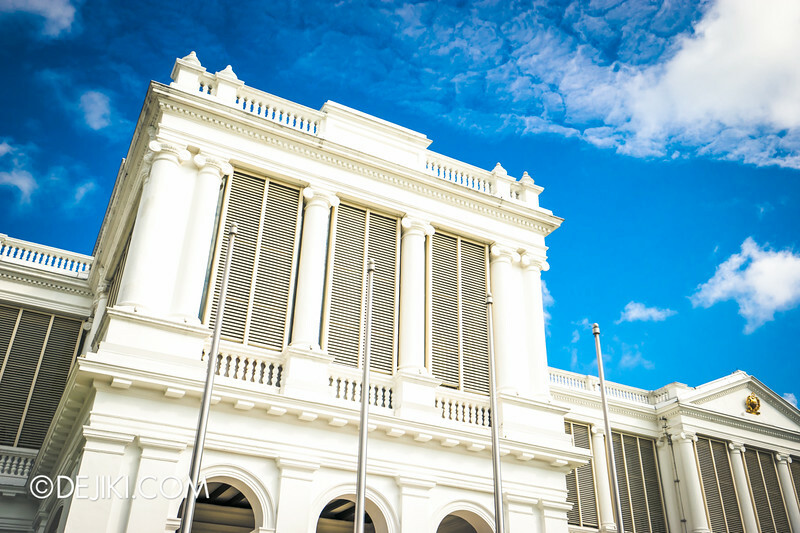 And that concludes the Grand Photo Tour of the Istana. 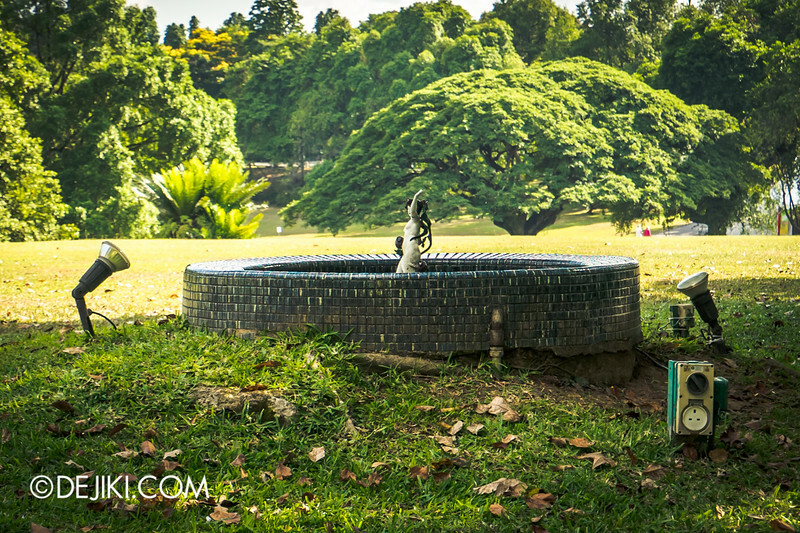 Would you make a trip down to see it yourself? Save the date for Deepavali this year. 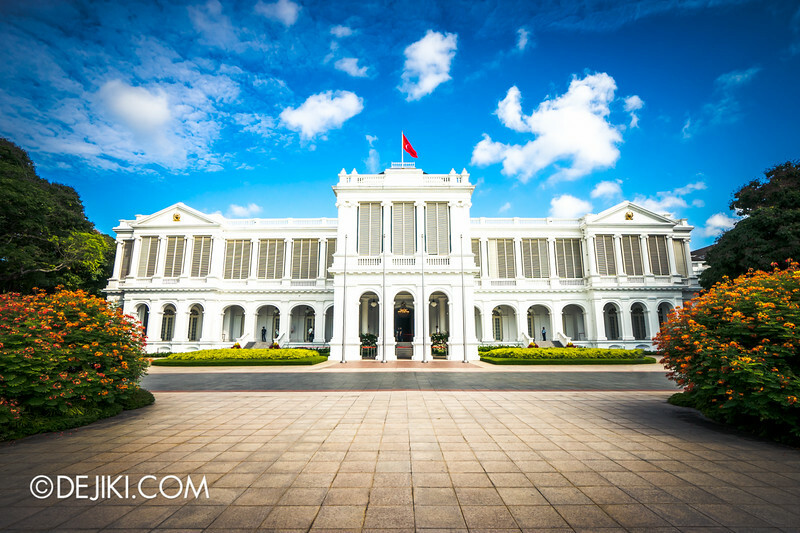 The Istana will be open to public again on 10 November 2015!